Surgent CIA Review (formerly ExamMatrix CIA Review) is an exam preparation online platform that dynamically reacts to how you answer every question. Surgent’s most well known feature is the A.S.A.P. technology, but there are other pros and cons that you need to consider. Check out my analysis below. Disclosure: The I Pass Team may earn a small amount of compensation if you purchase from our links; our team uses these revenues to maintain the site and produce awesome free content just for you! Get the Surgent Code & Save! The one thing that sets Surgent from others is its unique adaptive learning technology platform. The system “feeds” you with questions at your appropriate level, and as you learn, you will get more complex and difficult questions. Put it in another way, the software identifies your strengths and weaknesses and then adapting your study sessions to your personal study needs. Most readers told me the questions in Surgent CIA were much harder, but the explanations helped them understand the concepts. This made it easier for them to tackle difficult questions on the actual CIA exam. As a customer you get 18 months of full access. Updates are done periodically online and therefore you always get the most updated version. Another benefit of getting Surgent CIA review is that you can get a refund if you can prove that you have spent sufficient amount of time studying using Surgent and still failed. The proof is based on the average time spent on each question, the average score in practice questions, and documentation that you took the exam within one year of purchasing their product. 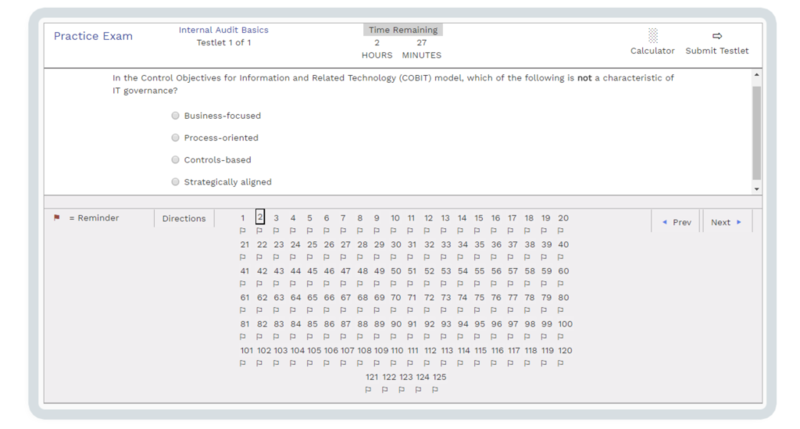 If you have solid knowledge in internal auditing through college studies and work experience, you may only want to get a test prep software. This is really where Surgent shines as they are a very good test prep option, plus they include PDF textbooks. If you are interested in the software, the Surgent folks can give you a webinar and show you exactly what the software looks like and its capabilities. Surgent CIA comes with 3 reference books for exam preparation. Based on comments from my readers, you cannot rely on these books to pass the exam. Since Surgent is a software platform, we can only expect technical support. In other words, you cannot ask a question on the CIA exam content itself. There is no personal counselor or online forum if you get stuck in a concept or a particular question. Surgent CIA Review costs $189 for single-part, and $499 for a complete set. In comparison, Gleim CIA costs $139-$169 per part and $447 respectively. It’s still reasonable and affordable but you have other options. If you are looking for a review course provider with complete study materials, Surgent CIA Review may not be the best choice. Retakers who don’t need extra review materials but want to practice on a new set of practice questions. Gleim CIA Review Discount Code April 2019: Save 20%!